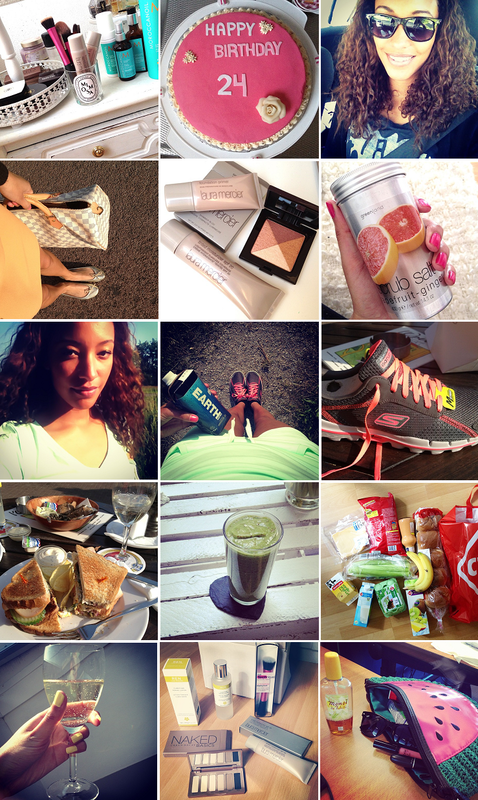 An active week on Instagram! 1: My beauty desk where I storage my daily make-up, hair products and body-cream/perfumes. 2:My best friends turned 24 years young! A friend of her had made this gorgeous and yummy pie. 3: Me in my friends car wearing a Zoe Karssen tee. 4: The sun was shining so it was time for a dress and showing them legs! 6: New delicious bodyscrub "Grapefruit-ginger" from Greenland. 7+8+9: Running on my new Skechers. I love them. And I also love my mint top and short from H&M. 10: Hmmm the best sandwich there is. Me and a friend sat down on terrace on a sunny day. 11: My best friend has made me this smoothie. Yummy and healthy! 12: After a heavy weekend (party and fun) my body needed some vitamines. Most of the time I come home with only chips, candy, cookies and other bad stuff.. but sometimes you feel that you need some healthy stuff right? 13:Weekend= A glass of wine. The perfect way to relax. 14: My order at HQhair.com (minus the Laura Mercier) I would love to try Ren skincare and I was thinking about buying the Urban Decay Naked basics palette for a while now. Now I did. 15: My cute watermelon bag. In combination with the Monoï spray in screams summer.